North Carolina pastor Andrew Brunson is expected to be released in coming days after two years of detention in Turkey. The Trump administration, however, isn't fully confident that Turkey will follow through with the Brunson agreement because Ankara was close to a commitment to release him several months ago but did not, one senior administration official said. Two senior administration officials said the White House had not been notified of any change in Brunson’s Oct. 12 court hearing as of Thursday morning. A spokesperson for the Turkish embassy in Washington did not respond to a request for comment. The White House declined to comment on the record and the Brunson family said they are also not commenting at this time. 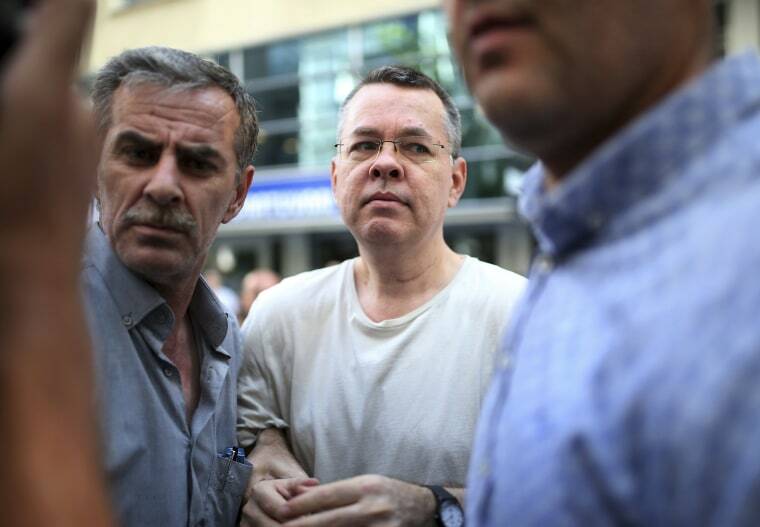 The Turkish government has accused Brunson of helping terrorist groups, charges he has denied. The Trump administration has aggressively pushed for his release, saying he was wrongfully detained. In July, Turkey released Brunson from prison and moved him to house arrest. He faces a possible sentence of up to 35 years in prison if convicted. An agreement on Brunson’s release was advanced in discussions last month between Turkish and U.S. officials, including Secretary of State Mike Pompeo and national security adviser John Bolton, during the gathering of world leaders for the United Nations General Assembly in New York, the senior administration officials and person briefed on the matter said. The White House does not plan to publicly address Brunson’s release in advance of his court hearing out of concern that doing so would jeopardize it. Officials from both countries have signaled Brunson’s possible release in recent weeks. In remarks to the Jewish Institute for National Security of America on Wednesday, Pompeo referred to Brunson’s situation, saying that releasing the pastor would be the "humanitarian thing for Turkey to do." "I am very hopeful that before too long Pastor Brunson will, he and his wife will be able to return to the United States," Pompeo added. Brunson is an evangelical pastor from Black Mountain, North Carolina. He has spent more than two decades living in Turkey, where he ran the Resurrection Church in the western city of Izmir. He was detained in Turkey in October 2016 and charged with helping individuals Turkish President Recep Tayyip Erdogan says were behind a failed coup earlier that year. Brunson’s imprisonment has increasingly strained the relationship between the Trump administration and Turkey, a NATO ally. Brunson’s release could be more likely given that his court hearing comes at a time when Turkey is seeking U.S. support for challenging Saudi Arabia in response to the disappearance of journalist Jamal Khashoggi, according to Soner Cagaptay, director of the Turkish Research Program at the Washington Institute for Near East Policy. Brunson’s release "could reset Trump and Erdogan’s relationship," Cagaptay said. Administration officials have said the release of Brunson, as well as other Americans, would be a significant step toward mending ties between the U.S. and Turkey. "This administration has been actively engaged in seeking Pastor Brunson’s release for months, along with NASA scientist Serkan Golge and the employees of the U.S. mission in Turkey," the third senior administration official said. "A positive development in the cases of Pastor Brunson, Serkan Golge, and local employees of the U.S. mission in Turkey would do much to improve confidence and to restore the bilateral relationship." Vice President Mike Pence has been a leading critic of Brunson’s detainment and advocate for his immediate release. Trump announced economic sanctions against Turkey in August after talks with Ankara failed to result in Brunson’s release. He also has publicly called for Erdogan to release Brunson. "A total disgrace that Turkey will not release a respected U.S. Pastor, Andrew Brunson, from prison. He has been held hostage far too long," Trump wrote on Twitter in July. "He has done nothing wrong, and his family needs him!" According to the Turkish newspaper Hurriyet, Erdogan told reporters this week when asked about Brunson: "I must obey whatever the decision the judiciary gives."